Wyndham Ocean Walk resort is an award winning, 19-story marvel of Art Deco styling with South Beach luxury situated directly on the stunning pedestrian-only stretch of Daytona Beach. The resort offers spacious 1, 2, and 3-bedroom vacation suites – each complete with fully-equipped kitchens, large living rooms and bedrooms, in-unit washers/dryers, with some units offering whirlpool tubs in the master bedrooms. Located across from Daytona Lagoon water park and the Ocean Center Convention and Civic Complex, Wyndham Ocean Walk is an impressive 80,000-square-foot resort, featuring three outdoor and, two indoor swimming pools, three hot tubs, live entertainment, a 3,200-square-foot exercise center as well as an indoor nine-hole miniature golf course and outdoor island putting green surrounded by a 250-foot Lazy River complete with a water slide and aquatic island playground. Additional amenities include a gift shop, Turtle’s Nest tiki bar, The Eatery Market Shop, and Landings Lounge catering to a variety of tastes with scenic ocean views and 5,000 square feet of recreational facilities. 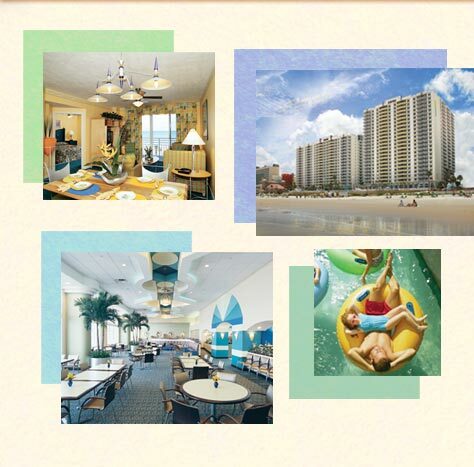 Wyndham Ocean Walk is also the perfect location for your next meeting or corporate outing, with 6,000 sq. ft. of meeting and ballroom space.